We sell our Premium Potting Mix in a 1 cubic foot bag. 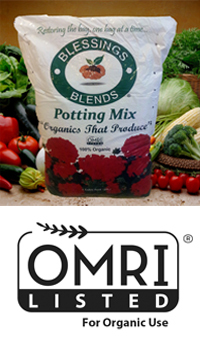 BLESSINGS BLENDS Premium Potting Mix is great for Home Gardeners and Organic Producers. 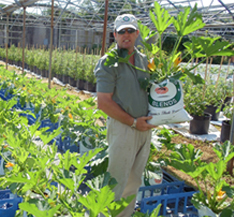 They can be confident that they are using Exceptional Quality Potting Mix to produce tastier fruits and vegetables. BLESSINGS BLENDS Premium Potting Mix is created from Compost from a consistent stream of yard and poultry waste located on Delmarva. This process converts thousands of tons of waste into beneficial products which not only rejuvenates the soil, but helps to restore one of our national treasures, the Chesapeake Bay. Great for repotting plants, container gardening, outdoor plants and growing food in containers.